You will love the fine detail and clever way this Doberman Figurine Black MyDog captures all the best features and spirit of your favorite friend. 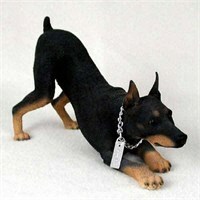 Our Doberman Figurine Black MyDog will look great displayed on your desk at work or on a mantel at home. Perch this tiny statue next to a framed photo and you?ÇÖll have an instant focal point in your living room. 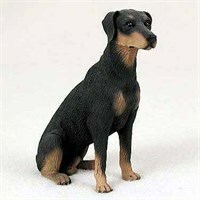 Our delightful Doberman Figurine Black MyDog are made of stone resin and are hand painted to feature exceptional detail. This fine Collectible measures 4-5 inches in size. You will love the fine detail and clever way this Doberman Figurine Black Uncropped captures all the best features and spirit of your favorite friend. Our Doberman Figurine Black Uncropped will look great displayed on your desk at work or on a mantel at home. Perch this tiny statue next to a framed photo and you?ÇÖll have an instant focal point in your living room. Our delightful Doberman Figurine Black Uncropped are made of stone resin and are hand painted to feature exceptional detail. This fine Collectible measures 4-5 inches in size. Beautifully hand painted, this delightful Black Uncropped Doberman Bottle stopper will be the talk of the party at your next get together. At approximately 1½" to 2" tall, our intricate Black Uncropped Doberman Bottle stopper looks just right sitting atop just about any bottle. Weather a gift for a dear friend or family member or simply a new decoration for your home, all Doberman lovers will surely enjoy this gorgeous stopper. 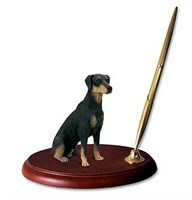 This magnificent Black Uncropped Doberman Note Holder will make sure that you never forget that important meeting. At approximately 6 x 2.5 inches our friendly Memo Holder will always stand out on your kitchen counter, desk or anywhere else you decide to place it. Or as a gift for a friend or loved one, this delightful Note Holder will always bring a smile. This spectacular Black Uncropped Doberman Pen Holder will spruce up any desk or work station. With a beautiful wood plaque mount, an intricately designed figurine and a handsome gold tone pen, your new desk accessory is sure to bring up lots of conversation about your favorite friend. The Pen Holder is always a fantastic gift.